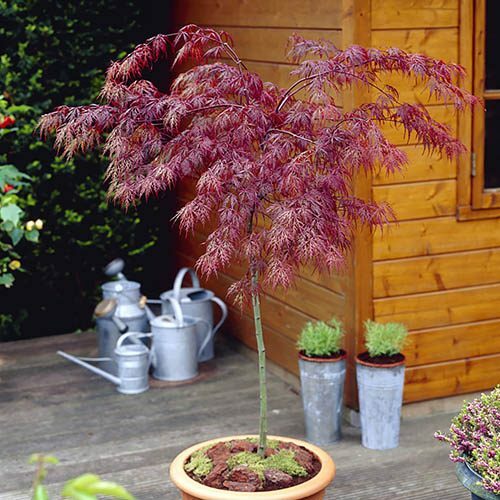 A small and slow growing tree, ideal for oriental style gardens, great in modern containers. This gorgeous fine-leaved selection of weeping Maples makes a wonderful feature or specimen plant. Never taller than a small tree, it is slow growing, and makes a super focal point. And with this standard clear-stem form, you get extra height to show off the weeping habit to it's very best. Covered in lovely red feathery lace foliage from early Spring, which darkens to burgundy over Summer, and then finally a riot of bright orange red in Autumn before it falls. Grow in a large pot, or in a lawns as a feature plant, or in mixed borders - perfect both in modern, minimalist gardens, or more traditonal mixed settings. Adds a lovely textural and colourful feel, which will last many, many years. Supplied as a rafted, standard form plant with 50cm clear stem, and 90cm - 1M height.